Snow makes me happy. And Scrappy too. He has taken to liking it quite well. I have forgotten how funny it is to watch a pet experience snow for the first time. 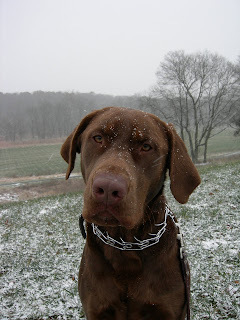 He gladly ate his way along the walk, licking at the snow on the ground, leaving nose trails behind. Very funny. I must add that now he and I have been walking every morning for the past 3 months that he has become quite well behaved. I noticed today that he minded the street crossing heeling without my command. Yes sir, Scrappy my friend you are growing up to be a fine dog. My neighbor really is lucky to have this chap. And I am glad to be able to enjoy these quiet snowy days with someone just as fond of snow as I.